of the thoroughbred. 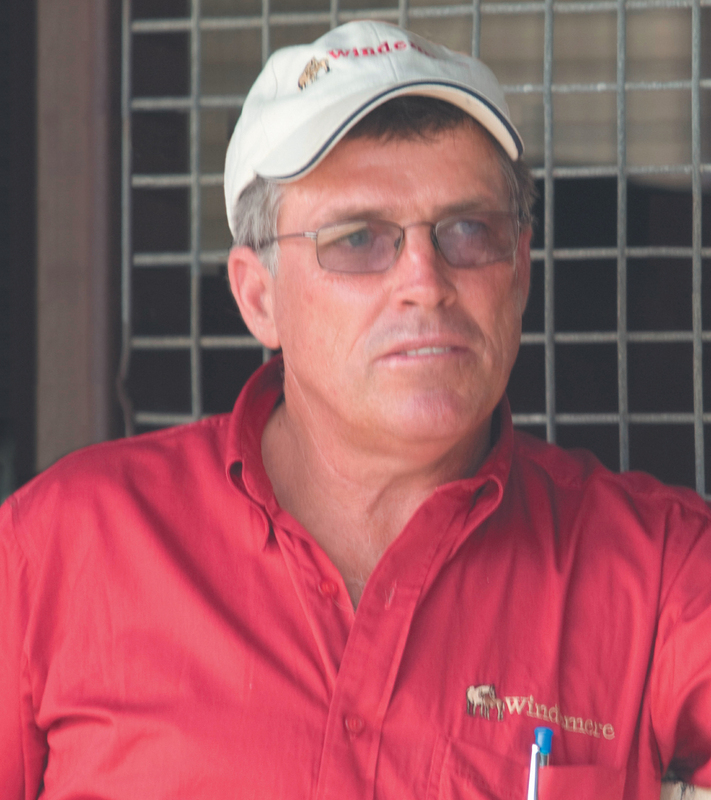 As a breeder and trainer, the Windemere Stud principal had some great rewards, as well as “being on the wrong end of the pineapple”, but for someone who was “always mad about horses”, he wouldn’t change a thing. LIFE is pretty good these days for Steve Tregea and it is a reward for effort that has come from a passion for horses and a successful business career. After gathering experience in the industry over the previous decade, Steve and his wife Anne established Queensland Agricultural Seeds Pty Ltd, with its base in Toowoomba, a quarter of a century ago. It was a struggle to begin with, but hard work and long hours gradually paid dividends as markets were opened up in Australia and abroad. The result was that by the mid-1990s Steve felt the time was right to steadily ease his way out of the day to day running of the business. So with Anne handling the office administration, a role she still fulfils, and Rick Ramis as company manager, Steve was able to indulge his passion for breeding, owning and training horses as well as riding track work. Although it is a lifestyle he would not change, he has come to realise there are a lot of pitfalls associated with the do-it-yourself approach. “When you are doing the breeding and racing yourself you are copping it all,” he said as he looks over a panoramic view of the Darling Downs from his Windemere Stud homestead. “You have to cope with the mares slipping, foals needing corrective shoeing, the accidents, the illnesses and the ones breaking down. Like so many “farm boys” in the thoroughbred industry Steve’s initial experiences among horses was as an enthusiastic young competitor at pony club and in show ring events. His parents, Bill and Pat, had a dairy farm at Peachester, a small town in the Sunshine Coast hinterland about 75km north of Brisbane, and the interest grew from there. “As well as the dairy cattle we had horses and as I was mad on horses I wasn’t very old before I began competing in pony club and at shows.” After completing his secondary education at the high school at Caboolture Steve enrolled at the agricultural college at Gatton in the Lockyer Valley about 90km west of Brisbane. On securing an agricultural certificate Steve joined the Department of Primary Industry as a cadet. At that stage he was based at the Brigalow Research Station at Theodore, a rich agricultural area nearly 600km north of the Queensland capital, and it was while at Theodore where he was working in the beef animal husbandry branch, that the then 20 year-old first became active in racing. A 1973 foal, his purchase was named Just Gomer, after the awkward television series character of the time Gomer Pyle and, capitalising on his skills in the saddle, Steve began training him on the research station’s grass airstrip. Although Just Gomer was a gangly type he began paying down the bank loan by winning a two year-old maiden over 850m at Gympie. He went on to record another seven wins over the next two seasons before being sold. While that was happening Steve also rode “for a couple of seasons” as an amateur jockey at meetings in Rockhampton, the “Beef Capital of Australia” some 630km north of Brisbane and other central Queensland tracks. He also rode work with one of the leading trainers in the region, Mick Hanlon who had stables at Theodore, and Steve would also accompany his horses to the races most weekends. with Laurie Russell who had developed an impressive training centre nearby that now belongs to the Huddys of Shoot Out fame. It was during that time he and Anne met, romanced, were married and had Casey, who is now 26, Hannah, 24, and Samantha, 20. Then in 1987, with his wife’s total support, Steve and Anne became co-founders of Queensland Agricultural Seeds with a head office in Toowoomba. Still remaining a privately owned company Q.A.S. has found a niche in the market as a supplier of tropical and temperate pasture, crop and turf seeds for sowing. These seeds are supplied to an extensive reseller network within domestic and international markets, particularly in South-East Asian and Pacific Island countries. Then with the Q.A.S. flourishing, they purchased an adjacent 70ha property. They subsequently bought 40ha more directly across the road, built another house, added stables, constructed yards and fenced paddocks. At that stage Steve began easing out of the company and turning to the horses while Anne took over all the office administration. “I started acquiring a few nice mares and set up the horses as a breeding business with the idea of selling the yearlings. I also began training a few we kept.” The first of these acquisitions was the Gairloch mare Bourrache (FR), who was secured from Collingrove Stud at Nagambie in foal to that distinguished race horse and sire Rory’s Jester. From that mating Bourrache, who was stakes placed winner at Deauville, produced the multiple stakes placed Melbourne winner Bourree. Another early buy was the Mighty Avalanche mare Gem of the West, whose seven wins had featured the AJC Light Fingers Stakes-Gr.2, QTC C.E. McDougall Stakes-LR and two other Listed races. His activities further intensified in 1998 when he bought Knowledge who had been raced by leading Melbourne owner Lloyd Williams. A powerful individual by Last Tycoon (IRE) from the Kings Island (IRE) mare New Acquaintance (NZ), Knowledge had defeated Rose of Danehill and Sports in the VATC Blue Diamond Stakes-Gr.1 after taking the Blue Diamond Preview-Gr.3. Rather than having Knowledge at Windemere, Steve came to an agreement with Murray Wise to begin standing the horse at nearby Bahram Stud. He was later transferred to Fred Brown’s Glen Avon Lodge following the sale of Bahram. Subsequently bought by Dynamic Syndications for $190,000 at the 2008 Inglis Melbourne Premier, Reward For Effort went on to capture the Blue Diamond Stakes, Blue Diamond Preview, STC Concorde Stakes-Gr.3 and MRC Sir John Monash Stakes-LR, for earnings in excess of $930,000. He is now standing at the Willis family’s Chatswood Stud at Seymour in Victoria where he served 150 mares in his first season. Fortunately, Miss Excellence, a sister to Reward For Effort, is a member of Windemere’s broodmare band and has produced a colt by Librettist and fillies by Sebring and Manhattan Rain. Also among the purchases was the unraced Alleged mare Open Question (USA), who was bought for $350,000 at the Bellerive Dispersal Sale. At that stage Open Question had produced, to a mating with Imperial Prince (IRE), the 1993 VRC Oaks-Gr.1 and VATC 1000 Guineas-Gr.1 heroine Arborea and the Personal Hope (USA) horse Paris Dream whose successes included the STC Pago Pago Stakes-Gr.2 and the AJC Up And Coming Stakes-Gr.2. She proved to be a worthwhile investment for Steve by producing for Windemere the 2004 VATC Sandown Guineas-Gr.2 winner Binding, a son of Belong To Me (USA). The stud has retained a sister to Binding, Answer Me, whose colt by More Than Ready (USA) sold for $250,000 at last year’s Gold Coast Magic Millions Yearling Sale. “Another mare we bought was Early Song who became the dam of Canterbury Guineas winner Fine Society. We have two half-sisters to her. Another Gr.1 winner we have bred is Star Shiraz who is by Sequalo from Starshine Express. We sold Star Shiraz for $15,000 and she won the Sires’ Produce Stakes in Brisbane, another five races, and nearly $800,000 in prizemoney. She was later sold-on to Darley for $1.15 million I think, so we got the pineapple end of that deal. A more recent purchase Steve has high hopes for is the Iglesia mare Miss Argyle, a sister to the multiple stakes winner Diamondsoninside whose efforts on the racetrack included a second in the AJC Gimcrack Stakes-LR. Her first foal Cheyenne Warrior who is trained by Anthony Freedman, won at Sandown at his debut and followed by taking the TTC Gold Sovereign Stakes-LR (1200m) at Launceston at his second appearance. Miss Argyle has a rising two year-old colt by Nadeem, who was passed in at this year’s Magic Millions, and a weanling colt by Redoute’s Choice. “She’s a lovely type to have around, and having three colts in a row has been a good start for her and she is now in foal to Drumbeats, so it is all looking promising.” Along the way, as the numbers he was keeping and training were climbing, Steve bought 0.4ha on the racecourse at Toowoomba and built a 24-horse barn. He also, until the last couple of years, ensured he had hands-on experience by riding track work. “We’ve got some good prices for yearlings we’ve sold, but for one reason or another you are left with horses you can’t sell. They mightn’t be right for the yearling sales or they aren’t by stallions that are commercial propositions when they come around to be sold. There is an upside however, because it has meant Steve’s red and white halves are regularly going past the post first in races in Brisbane, Toowoomba, and various country tracks. His most notable win so far, as a trainer, was the 2010 GCTC Goldmarket Handicap-LR with Baqaba, by Easy Rocking from Bouree. Baqaba is now on the sidelines, but Steve has 14 horses he has retained in work under his care at Clifford Park. “Training is a full-time business and it gets the adrenalin going when you go to the races and especially when you have a winner or two. We have cattle as well on Windemere, which I find calming, but I enjoy anything to do with horses. It’s in your blood.